Taxi from airport: 700 rupees (approximately US$13). Taxi to Boudhanath: 350 rupees. It all adds up and starts to eat into your travel budget. Why not take the local transportation? If you’re adventurous enough to try tuk-tuks and micros, they’re easy, fun, and cheap. Once you get the hang of it your wallet will thank you. Learn numbers. Devanagari is more straightforward than it looks. The number 14 (Patan Durbar, Monkey Temple, Jawalakhel Zoo) looks like a 98, 5 (U.S. Embassy, Lazimpat) like a Y with a curl. A 2 (Boudhanath) is a 2. Orient yourself. Kathmandu is laid out in a reasonably uncomplicated way. Ratna Park, in the center of the city, is the hub from which most tuk-tuks and micros depart. Sundhara, on the park’s west perimeter, has signs posted with numbers and destinations. Work out on your map where you want to go. Ask. Nepalis are nice. They’ll steer you in the right direction. Flag the vehicle down anywhere along the road. It’ll stop. Tell the driver or conductor where you want to go. Settle in for the duration. 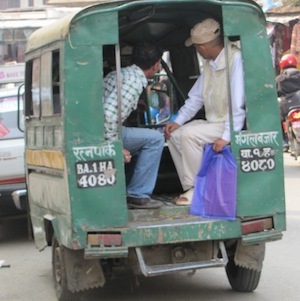 If you’re in a hurry, tuk-tuks are not your preferred choice. They whine up and down the street at the speed of an average trot. Watch for your stop. Bang on the ceiling when you want to get out. Pay. Reach in the front window and hand the driver your money. If you’re not sure, give a larger bill. Drivers don’t cheat. Even if you get on the wrong bus and end up somewhere you didn’t plan on, you’ve gotten a more intimate view of this fascinating city than you would from the back of a speeding cab.